Dig the pond 24 to 30 inches deep to allow leeway for a finished depth of 18 to 24 inches. Have straight sides and a uniform depth. Line excavation with one-half inch tie rods or use #3 construction wire spaced one foot apart. Have the tie rod frame one inch above the soil to allow the cement to wrap around it. Lay an inexpensive wire mesh over the tie rods for the cement to adhere to. Do not add any rocks or tile, etc. at this point. Use a mixture of three parts sand to one part plastic cement. Add 1 1/2" fiberglass (Microfiber secondary concrete reinforcement - available at hardware stores) to mix. If ordering a concrete mix, a seven sack pea gravel pump mix at 3000 psi is best. Add one bag of microfiber per yard of concrete. Lay the cement all at one time or in layers. Do not cement the sides and bottom at different times. You should have a total of three or four inches of cement. Allow the cement to harden but not dry. It must be kept wet at all times. Sprinkle lightly with water every hour. Do not allow to freeze. Rocks or tiles may now be cemented into place. 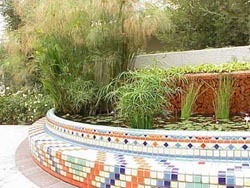 Fill as soon as the pond is sufficiently hardened to hold water. It is a good idea to either seal or paint the pond. TO PAINT - The pond must be etched to allow the paint to penetrate the surface. To etch the pond, fill with water and add one gallon of household vinegar for each 200 gallons of water. Allow to et for three days. Drain pond and allow to dry fully. Paint with Nelsonite Rubber Based Pool Paint. Do not dilute or thin paint. Allow the paint to dry seven to ten days. Rinse. TO SEAL - Make a solution of pure plastic cement and water, mixed to the consistency of paint. Paint this mixture over the entire pond surface. Follow curing instructions before adding plants for fish. TO CURE - Newly cemented ponds release quantities of free lime into the water which is toxic to fish and plants. By curing the pond, this danger is removed. To cure, mix one-gallon household vinegar to each 200 gallons of water in your pond and let set three days. Empty and rinse thoroughly. Then fill and you are ready to plant. A faster method is to mix one gallon muriatic acid to four gallons of water. Briskly scrub all surfaces of the pond with this solution using a brush or broom. The cement may bubble some as the lime works free. This will not harm the pond. Mix more solution if needed being sure to reach all surfaces. Rinse the pond thoroughly, drain and refill. Your pond is now ready for fish and plants.